Roasted garlic is one of those things that can enhance mayonnaise, hummus, or dressing. It can be smeared on a piece of grilled chicken or incorporated into a savory sauce. It can also be spread on flatbreads and eaten by itself. In any event, it’s simple and can add life to a lot of things you eat. 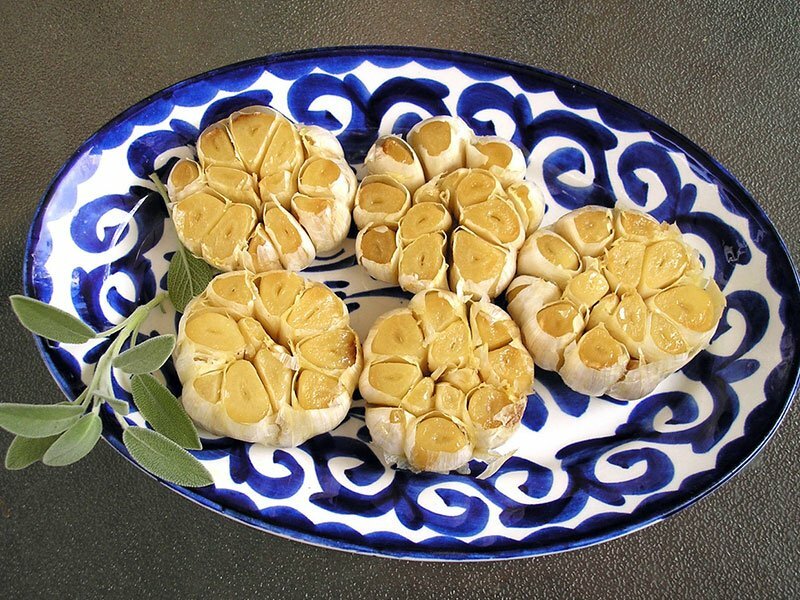 Peel away outer layers of garlic bulb skin, leaving skins of individual cloves intact. Trim ¼ to ½ an inch off the top of the bulb, exposing individual cloves of garlic. Place garlic bulbs in baking dish. Muffin pans work well for this purpose. Drizzle a couple of teaspoons of olive oil over each bulb, using your fingers to make sure the garlic head is well coated. Cover with aluminum foil. Bake for 35–40 minutes or until cloves feel soft when pressed. Allow garlic to cool enough so you can touch it without burning yourself. Use a small knife to cut skin slightly around each clove. Use cocktail fork or your fingers to pull or squeeze roasted garlic clove out of their skins.